My dear Readers, you may recall my blog post in October about First Signs. Are we not called to be aware of the moment when a “first” takes place? We attend our minds to these things; we seek them out. Though we may have felt anxious at the time we can often remember with clarity and fondness our first day at a new job, a first date, our first night in our college dorm room. Parents are hyper vigilant not to miss first steps. In fact, my dearest friend Nathalie posted her daughter’s first word today! We take note of the firsts, write them in baby books or planners or diaries–or, if you are more like me you scribble them on post-it’s and in church bulletins. My sorority sister Dana is a voracious reader (a good thing since she’s a reading specialist for our local public school system). She has been consuming so many baby books, magazines, and online articles because she had her first child this year. Often she tells me a snippet she learned and I think, “That’s nice, but my baby is almost a decade; this is old news to me.” But when she told me about reading an article that encouraged to take note not of the first but of the lasts…that got me. 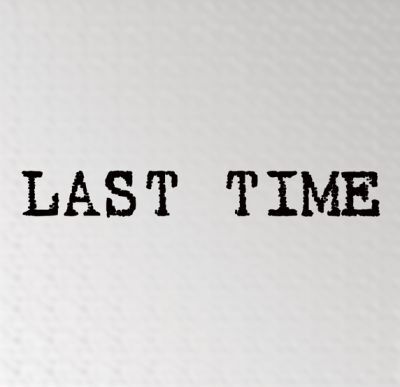 How do we know the “lasts”? Certainly, graduation ceremonies and retirement parties help, but what about the everyday “lasts”? After Dana shared with me what she read I tried to be attentive. I really did. Only once did I recognize that I didn’t miss it because my daughter Katarina announced to me that she lost her last tooth. I cried. I hadn’t cried over her first tooth—or any tooth thereafter, but I cried over this last. A chapter closed. Even now, I can’t remember the last time I rocked my children to sleep or sang the “cow song” to Ben or the last tender moment I had with my husband before our marriage had its last day. Things sometimes just end without our awareness or–even worse–our permission. Thankfully, I do know that one year ago today was the last time I talked with my mom. By this point in her cancer journey she was bedridden and fading. I called her via FaceTime. I can envision that moment now as I write you. She wasn’t looking at me; she was looking beyond me. She was having trouble speaking so our conversation was short. I told her I loved her and she responded, “Ah uv ooo, ooo.” I told her I would see her soon because I was flying in on Friday–three days later. “Ohay,” she replied. During my recent trip to the monastery my friend Marianne posed this question: If you could just say one last thing to someone what would it be? Peace to you, dear Readers. 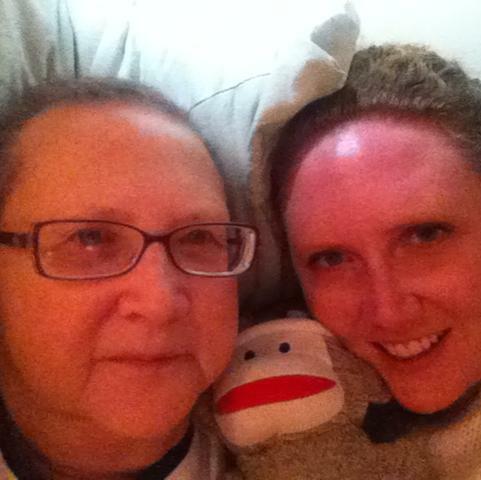 Mom, David the Cancer Slayer, and me November 11, 2013.
love this – very timely message for me. thanks for writing this, Elizabeth! I am so thankful for you! Beautiful, Elizabeth. I’ve pondered a lot lately on how everyone is so intent on teaching us how to live, but no one is anxious to teach us about death and dying. Thanks for the reminder about “lasts”…..we never know! Thinking about you….. I can’t think of anything better to say, or to hear someone say – I love you. It says it all.